WASHINGTON, DC — Americans have always appreciated a little rebelliousness. Chalk it up to our anti-establishment beginnings during the revolutionary war or our collective fascination with lawless frontiers. Vigilantes and superheroes have long defined our visual culture. We love an outlaw figure: someone who isn’t afraid to break a few rules in the name of ideological freedom. All the Rules Will Change, a survey of Robert Irwin’s work currently on view at the Hirshhorn Museum, takes as its theme the national pastime of rule flouting. Best known for his involvement with the California Light and Space Movement of the 1960s and his “conditional” artworks, which are not so much site-specific but site-dependent installations, Irwin is considered one of the foremost artists of the last 50 years. His work continually challenges visual perception and defies traditional classification. While he hasn’t produced a painting or even maintained a studio in decades, he began his career as a painter. It didn’t take him long, however, before he questioned the long-held rules of the medium, such as two-dimensionality, figuration, and framing conventions. 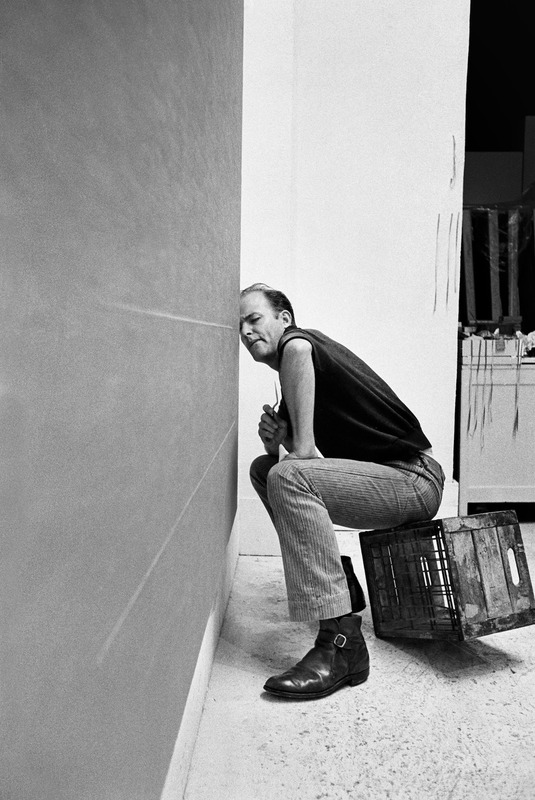 It’s at this initial point of his inquiry into painting that the Hirshhorn’s survey begins, as if to demonstrate that Irwin certainly knew the rules of art before he decided to break them. Dating back to the late 1950s, the earliest works in the show are the artist’s small, hand-held paintings, which were a reaction to the overwhelming, emphatic aesthetic of Abstract Expressionism. Unlike a Pollock painting, they are not large enough to consume the viewer or carry one away on a tide of gestural spontaneity. Instead, they seem deeply introspective, almost brooding, with layer after layer of oil paint, spackled like cake frosting across the canvas and intentionally interrupted by shapes and figures etched at Irwin’s sole discretion. These works were not designed to be hung on a wall and distantly considered; they were meant to be touched and experienced. By intending these paintings to be handled, Irwin defied the traditional rules of engagement with painting. Yet, their display within the exhibition re-inscribes the works within another set of rules: those of the institution. Laid horizontally in a vitrine, the paintings seem more like lifeless specimens than active participants in a viewer-object relationship. While this display choice is obviously practical — the constant manipulation by daily visitors would certainly take a toll on the paintings — it fundamentally squashes the very aspect of Irwin’s handhelds that made them remarkable. When it comes to the display of the artist’s line and dot paintings, however, the Hirshhorn couldn’t have done it better. The museum’s architecture allows for the perfect environment in which to encounter these extremely subtle works. 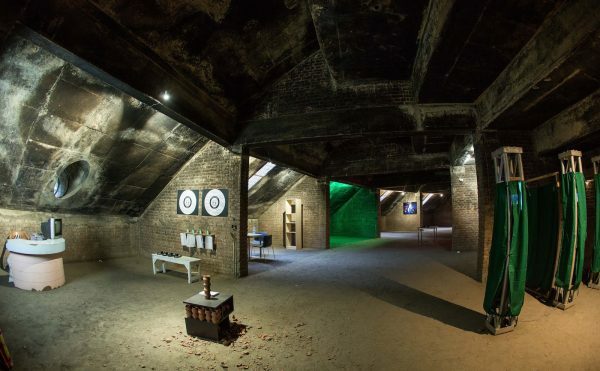 Temporary walls arranged radially put the building’s distinctive circular design to good use, creating individual bays for each painting. The result is almost like a slide carousel: each canvas has its own wall from which no other works can be glimpsed out of the corner of one’s eye. This is important to the success of the experience with these works since viewers need both eyes and a lot of focus to appreciate the paintings’ nuanced lines and minuscule dots. In the early 1960s, Irwin shifted to simple, horizontal lines to escape the figure-ground relationship rule in painting. Comprised of few thin stripes that extend nearly to the end of the over four-feet square canvases, the line paintings grow increasingly minimal over the years, with the latest featuring just two lines, often in the same hue as the background, making them nearly imperceptible upon first sight. Likewise, Irwin’s dot paintings must be seen in person. These seemingly blank canvases covered with miniscule dots in complementary colors simply just don’t show up in photographs or videos. They require the viewer to look at them directly for more than just a few seconds before the tiny paint pricks reveal themselves. Once spotted, the dots begin to dance and lift from the surface of the canvas as the eye desperately tries to keep pace with their hide-and-seek color play. It’s not until visitors encounter the artist’s discs and columns within the show that they realize how fun rule-breaking can truly be. After his dot series, Irwin eschewed painting entirely and turned his attention to light, believing it to be a medium in and of itself rather than just a way to illuminate his paintings. Using large acrylic discs and columns, created with the help of auto body shops and industrial fabricators, Irwin created pieces that relayed light back toward and around the viewer. Liberated from the close study of a canvas, visitors take selfies as they bask in the light of the radiant discs and kids hop around the columns, laughing at how their bodies bifurcate through the acrylic panes. The final gallery in the show features “Squaring the Circle,” the site-conditional piece commissioned specifically for the Hirshhorn. It employs scrim, which Irwin began using in the late 1970s to subtly alter the dimensions of a given space. For this work, the artist stretched floor-to-ceiling sheets of the gauzy white material against the curved interior wall of the gallery so that the once-rounded corners appear squared off. The only dead giveaway that anything about the room has changed is where light filters through the part of the scrim that extends beyond the central doorway. 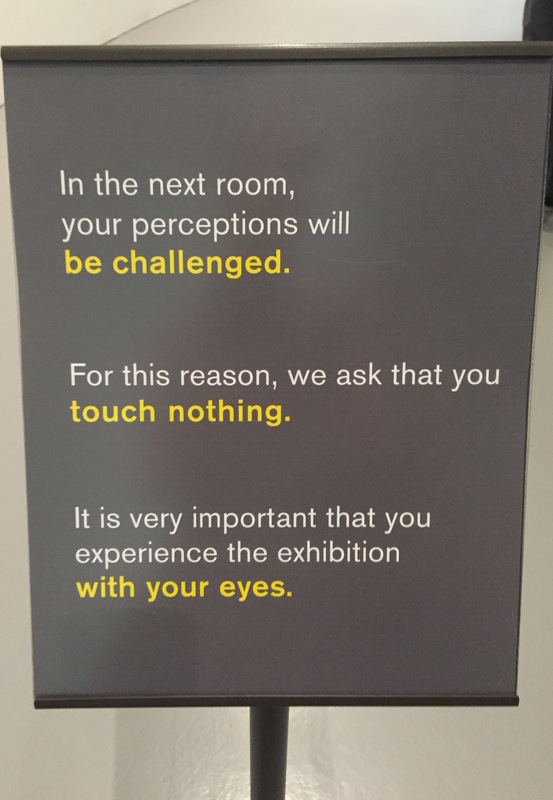 At the entrance to the gallery, a sign warns visitors that their perceptions will be challenged and solemnly advises them not to touch anything. Still giddy with the light play of the discs and columns, the visitors grow more excited for what dizzying masterpiece they’re about to encounter. 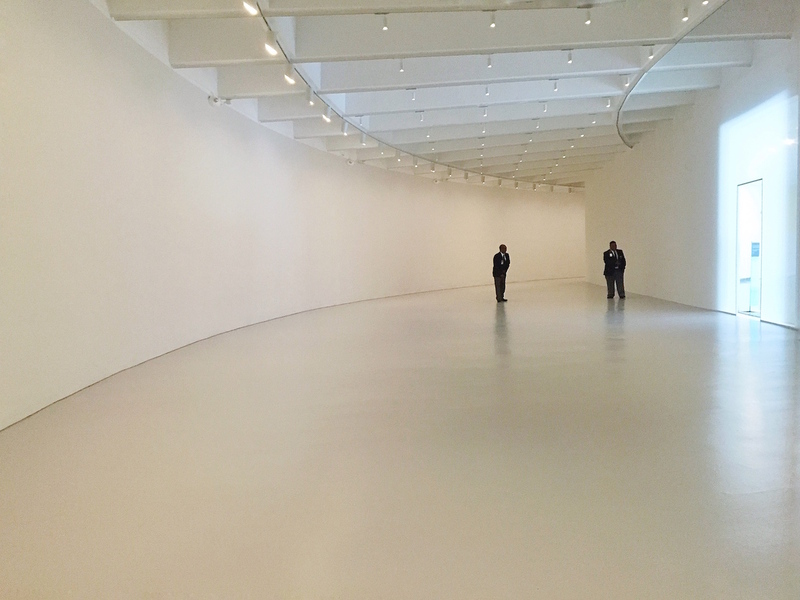 Upon entering, most people look around confused: they don’t see anything but white walls. Several visitors walk straight through, believing they’ve missed some kind of performance or other timed event. One man walked in and out of the gallery three times before he noticed the scrim, at which point he turned to the security guard and said, “So that’s it?” before he laughed and walked out. “Squaring the Circle” is confounding because it appears as if no rules have been broken – the space remains largely the same except for a small amount of square footage lost to the scrim’s placement. But even though it may not look like much, the whole function of the gallery — and our experience of it — has been altered. Perhaps it serves as a reminder that it’s not the rules that always need changing, but our expectations. 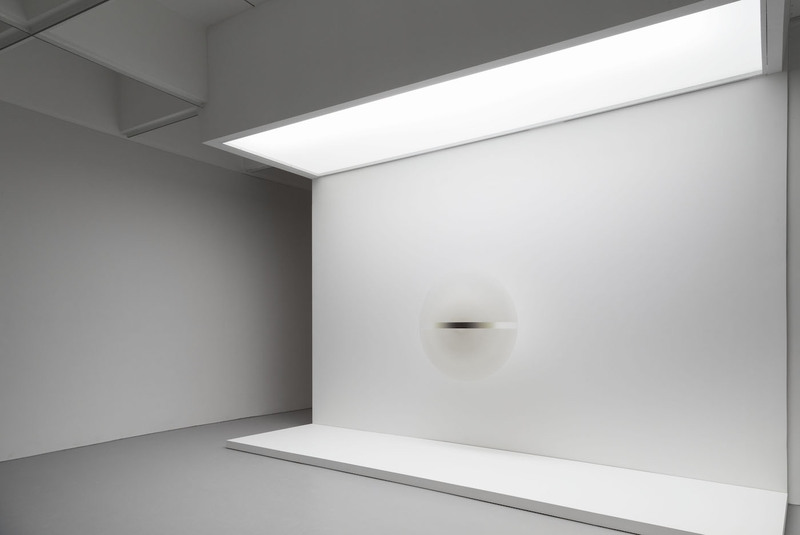 Robert Irwin: All the Rules Will Change continues at the Hirshhorn Museum and Sculpture Garden (700 Independence Ave SW, Washington, DC) through September 5.